The monster-hunting action-RPG Victor Vran is out today, and so is the Victor Vran launch trailer, which features a little bit of story and a little bit of gameplay. But listen to that narration and tell me: Does any of it strike you as a little familiar? "I hunt demons for a living. It's a lonely trade," the titular Mr. Vran says. "At first, you're the hero. The savior. But when the job is done, things quickly change. People realize you're as much a monster as the ones you hunt." Feeling confused? Like maybe you're in the wrong game, or perhaps the wrong space-time continuum, one in which The Witcher actually became a top-down action-RPG? There's a good reason for that. "Yes, it is Doug [Cockle], AKA Geralt," a rep for publisher EuroVideo Medien confirmed in an email. As for the gameplay, there's not a whole lot to see, but it's certainly very colorful. Victor Vran was developed by Haemimont Games, and while it's a departure from the studio's usual stuff—it's best known for strategy games, particularly the Tropico series—the user reviews on Steam seems quite positive so far. 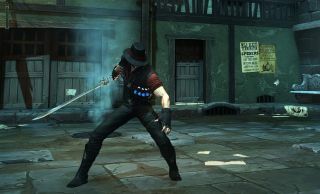 Victor Vran is out now, and is currently on sale on Steam for $18/£14.